"I made this dessert when I wanted to make something small and sweet for dessert. All I had in the house was cream cheese and chocolate chips, and thus the Shot Glass Cream Cheese Dessert was born. It is so simple and can be whipped up in an instant. You can substitute crushed graham crackers instead of mini chocolate chips if you'd like more of a crust." Line the bottom of 12 shot glasses with miniature chocolate chips. Whip cream cheese and sugar together in a bowl with an electric hand mixer on medium speed. 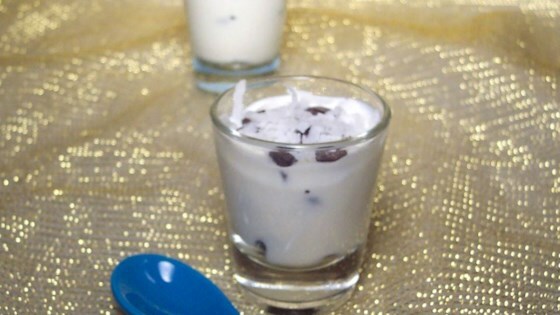 Layer cream cheese into the shot glasses, alternating with layers of chocolate chips. Garnish with milk chocolate candy kisses. Used little shot cups and did only the chips at the bottom, one layer of cream cheese and topped with mini m&m's. Good one serving dessert for a picnic today.